Oh, to be a raspberry in the summertime. Nestled into lemony batter, dotted onto tart crusts, sprinkled into salads. Fold in gently, they say. Lightly scatter. Garnish. These are crown jewels, people. Keep them whole. Keep them regal. I’m here to tell you: don’t. Here, you get to mash up these suckers. Mash, and mash, and shake, and mash some more. There’s something so satisfying, something almost voyeuristic, about mashing these berries to a pulp with some sugar and lime, then dousing the whole concoction with a ton of white rum. It feels like…a sin. It feels good, let me tell you. It also tastes good. Pour into a glass and take a long swig. No frills; just rum, lime, sugar, ice, and that summertime beauty: the raspberry. Adjust the sugar in this recipe to your taste – I usually put 1-2 teaspoons in, but go up to 3-4 if you prefer a sweeter drink. 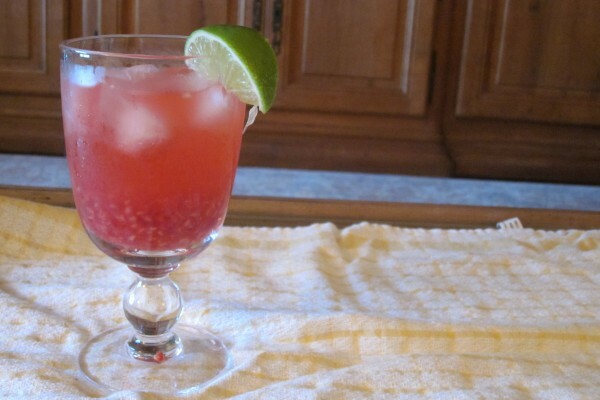 In a sturdy plastic cup, muddle/mash up the raspberries and the sugar with two of the lime wedges. The back of a mixing spoon will do; no fancy muddlers needed here. Add the rum and the ice. Cover well and shake vigorously. Remove and discard the crushed lime wedges. Pour the mixture into a rocks glass and use the remaining wedge of lime as a garnish.